1900 11 pcs of PLATE PROOF haléřových values issue 1900 in original colors without perf, Mi.10-20. Various damage on/for front face also reverse side, viewing of quality recommended. 1897 - 1919 2 pcs of PC, 1x Eagle 2 Kreuzer, Mi.P1 with CDS K.u.K MP IX / Banjaluka 25/7 97. 1x 5h Mi.P17 with incomplete MC Sarajevo 1919. good condition. 1916 Reg letter from Mostar to Boskovice, franked on back side 4 pcs militar. stamp. Mi.3x 27A, 25A, CDS MP Mostar 5.IX.16, arrival Boskovitz 9.IX.16. good condition. 1751 - 1793 comp. 5 pcs of folded small letters, 1x cancel. Von Wien (light imprint) on letter from Wien (Vienna) to Bratislava, 1x letter from Jank to Pest, letter from Korutnok (Slovak.) to Levoča, from Tallya to Levoča. Without damage. 1830 folded cover for letter, straight line postmark MÄHR. NEUSTADT, nice. 1833 folded service letter with straight line postmark STEINSDORF, nice. 1837 folded letter Ex offo, oval. postmark NEUDORF, nice. 1837 folded service letter with postmark SCHELLETAU in oval, on reverse whole paper bulk postage charge, nice. 1840 folded letter small format, with oval. postmark KREMSIER, on reverse two lined cancel. WIEN/ 19APR. 1841 folded cover úřed. 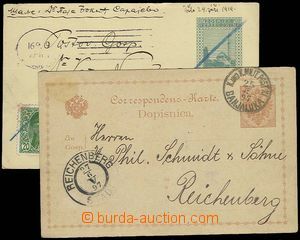 letter Ex offo, two lined postmark KOSCHETITZ/ 28April, short period action, on reverse round cancel. PRAG/ 30APR. 1841 folded pre-philatelic letter with oval postm. KREMSIER + 22/8, on reverse arrival straight line postmark TISCHNOVITZ / 15.AUG. Without damage. 1843 R folded service letter with oval. postmark BRÜNN/ Recomandirt/ 4.APR. + red two lined BRÜNN/ FRANCO + service postmark, extraordinary. 1843 folded cover official letter, straight line postmark POHRLITZ, nice. 1844 folded cover official letter Ex offo, with cancel. SCHWARZ KIRCHEN in oval + straight line postmark 1 April, nice. 1844 folded cover official letter with two lined postmark SCHELLETAU/ 16.FEB. 1846 money letter with frame cancel. BILIN / 5.Oct. + FRANCO. on reverse good condition 2 různé(!) seal. Very good condition. 1846 folded letter Ex offo, with two lined postmark ARBESAU/ 21.Aprl., arrival postmark. PRAG/ 22.APR., nice. 1847 folded letter with blue oval cancel. FRIEDEK 9/5 1847. Without damage. 1849 folded letter with straight line postmark LIPUWKA / 30 JAN, supplemented with postmark FRANCO. Nice print, only archiving folds. 1849 folded cover official letter Ex offo, two lined postmark STEKEN/ 13 Sept:, on reverse seal and postmark 13/9., nice. 1850? folded letter with oval. postmark TEPLITZ, arrival postmark. WIEN/ 30 JUL., seal on reverse odlomena, nice. 1850? folded cover private. letter with řádk. postmark V.WISCHAU, on reverse seal, small format, nice. 1850? folded cover official letter Ex offo, two lined postmark KROMAU/ 20.JUN., on reverse nice seal Berničního office in/at Krumlově. 1850? folded předal private. 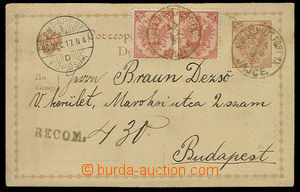 letter small format, with straight line postmark PODHORSAN, rare. 1865 folded letter Ex offo, CDS PRAG KLEINS 19.8., arrival postmark. WARNSDORF 20.8. 1869 folded letter Ex offo, CDS HEŘMANMIESTETZ 28.6., transit. PARDUBITZ/ BAHNHOFPOSTAMT 28.6., arrival postmark. TETSCHEN 29.6. 1870 folded service letter with CDS WARTENBERG 30.11., transit. RUMBURG 1.12., BÖHM. LEIPA 1.12. and arrival postmark. SCHLUKENAU 1.12. 1884 folded service letter with CDS LITOMĚŘICE 17.11.84, arrival postmark. TETCHEN a.d. Elbe 17.11.84. 1833 Prague newspaper from year 1833 with newspaper postmark + other 5 cut-squares with various newspaper postmarks. good condition. 1850 I.issue 1Kr, Mi.1, HP, type Ib, full offset! 1850 - 67 comp. 12 pcs of stamp. issue I (i.a. 2 Kreuzer on cut-square) + newspapers. strips and other 2 stamp. with nice pmk Alexandrien, Libčan (small diameter circle on/for newspapers. zn. ), Eger, Tirnau, Pilsen, Mori, Adria etc..
1850 2 stamp. issue I 3 Kreuzer various shades (carmine + pink) on cut-square, CDS Bahnhof (Railway-station) Brünn 22/5. Ruční paper type IIIa. 1850 issue I 3 Kreuzer on hand-made paper type Ia, used in Lombardy, cut square with CDS TREVISO / 2.Nov. Very nice. 1850 issue I 3 Kreuzer with plate variety stain in tail eagle, hand-made paper type Ia. 1850 issue I 3 Kreuzer, 2 strip + 1 stamp. mounted on cut-square, nice line CDS BERLLOWAR / 30.Dez. Decorative. 1850 issue I 3 Kreuzer, used in Lombardy, line CDS Pergine / 2.Lug, fold in stamp. 1850 issue I 3 Kreuzer, hand-made paper type IIIa, comp. of 2 cut-squares and 6 pcs stamp. from that 1x vertical 2 strip. CDS AUSSIG, LINZ, NEUMARKTL etc..
1850 issue I 3 Kreuzer, comp. 2 pcs of cut-squares and 6 pcs stamp. from that 1x 2 strip, all hand-made paper type Ib (1x type Ia). Nice CDS on cut-squares KOMÁROM and LAIBACH.